Entrance Hall: - Double glazed entrance door, glazed door to lounge. Lounge / Dining Room: - 6.10m x 4.00m (20'0" x 13'1") - (Maximum dimensions) Double glazed bow window to front and double glazed window to side overlooking gardens. Electric living flame fire in exposed brick surround, radiator, space for dining table. Kitchen: - 3.10m x 2.50m (10'2" x 8'2") - Fitted with a range of wall and base cupboards with work surfaces and tiled splash backs. Stainless steel sink, appliance spaces, tiled floor, radiator, Double glazed window to side and matching exit door. Inner Hall: - Recessed airing cupboard. Bedroom One: - 3.55m x 3.10m (11'8" x 10'2") - Double glazed window to rear, radiator, built in wardrobe with four sliding mirror doors. Bedroom Two: - 2.85m x 3.45m (9'4" x 11'4") - Double glazed window to rear, radiator. 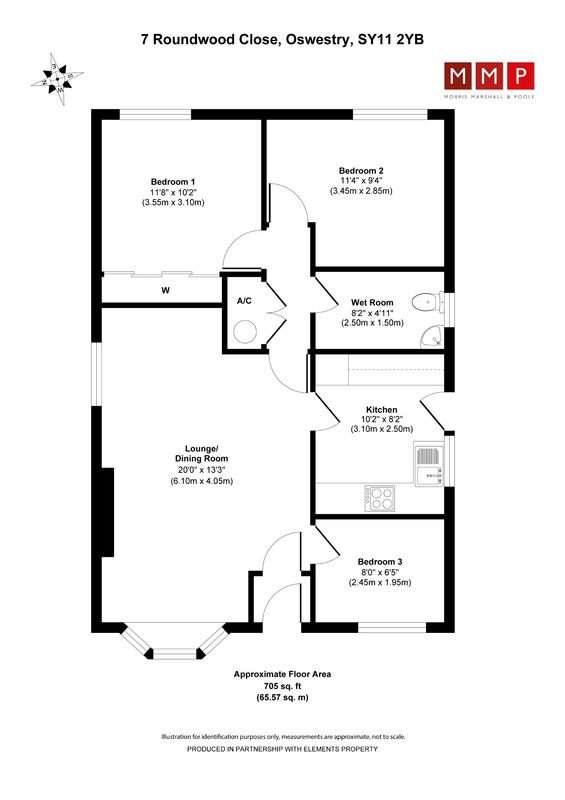 Bedroom Three: - 2.45m x 1.95m (8'0" x 6'5") - Accessed from lounge and suitable for alternative use as study. Double glazed window to front, radiator. Wet Room: - 2.50m x 1.50m (8'2" x 4'11") - With sealed waterproof floor and flush drain, fully tiled walls with wall mounted electric shower. Corner hand basin in vanity unit, contemporary WC, radiator and double glazed window to side. Garage: - 5.60m x 2.50m (18'4" x 8'2") - Brick built with up and over door, side exit door and window. Lights and power. Outside: - The property is set on a generous corner plot with good scope for extension or further development of the building subject to the appropriate approvals. The driveway provides off road parking for up to three vehicles with convenient outside tap. Garden to the front is lawned and well screened on two sides with mature borders. A gate gives access to the rear which is enclosed with fencing and hard landscaped with patios, fencing to boundaries. The side garden is also well screened with fencing with lawn and paved pathways. Tenure: - Freehold with Vacant Possession upon Completion of the Purchase. Services: - All mains services connected. None of the services, appliances, central heating system, chimneys flues and fireplaces have been checked and no warranty is given by the Agents. Council Tax: - Council tax band C payable to Shropshire Council. Viewing: - By prior arrangement with the selling agent's Oswestry office on - 01691 679595. All interested parties are respectfully requested to negotiate direct with the Selling Agents. Money Laundering Regulations: - On putting forward an offer to purchase you will be required to produce adequate identification to prove your identity within the terms of the Money Laundering Regulations (MLR 2017 came into force 26th June 2017). Appropriate examples: Passport or Photographic Driving Licence and a recent Utility Bill. Directions: - From the agent's Oswestry office follow Salop Road towards Shrewsbury Road and pass the entrance to Sainsbury's. Shortly after this turn left into Middleton Road and follow this until you pass the local Co-op Store and proceed into Cabin Lane. Turn 2nd right into Aston Way then 2nd right again into Roundwood Close. Continue to the end of the cul-de-sac and the property will be seen on your left. Consumer Protection Regulations: - Disposal of this property is being made on behalf of executors/beneficiaries acting on behalf of the estate. Website: - To view a complete listing of properties available For Sale or To Let please view our website www.morrismarshall.co.uk Our site enables you to print full sales/rental particulars, and arrange a market appraisal of your property. Mmp Survey Department: - If you are not buying through MMP then why not let our qualified surveyors inspect and report on the home you are buying before you complete the purchase.